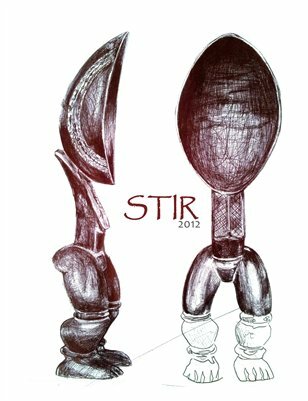 STIR is an exhibition of traditional and nontraditional printmaking. Artists Rabéa Ballin, Delita Pinchback Martin, Ann Johnson, and Lovie Olivia collaborate for a second exhibition to mix, stir and incorporate the organic ingredients of fine printing and good friendship. Using materials including plaster, feathers, vegetables, pillows, handmade paper and more, the four artists create an environment fit for a soul stirring dialogue.